"Baby lima beans are steamed in chicken broth. This is a very tasty lima bean recipe that is also low in fat." Heat a large saucepan over medium heat, and spray with cooking spray. Saute onions until soft and translucent. Pour in chicken broth, and bring to a boil. Add lima beans, and enough water just to cover. Bring to a boil, then reduce heat to low, cover, and simmer for 30 minutes, until beans are tender. 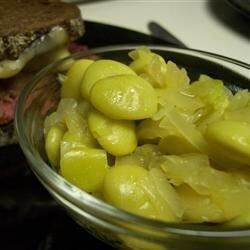 My son hates lima beans, but loved this recipe. I used olive oil instead of cooking spray and also added 1 clove of garlic. Really good, but the little onions weren't great while eating the beans. I would suggesting keeping them in large chucks and then straining out before serving.